The Ministry of Diaspora Affairs has waged a defiant war against this purported “silent Holocaust,” and is determined to protect For years, the Birthright Israel project has offered young Jews free trips to Israel. The politics and funding behind the program are inextricably tied to the Israeli occupation of Palestine. “I March 2018 9 the Jews from “God-forbidden” potential non-Jewish partners and anti-Zionist propaganda (read: critiques of the Israeli occupation of Palestine). Naturally, all means of protection are kosher. The objectives of Birthright are stated clearly on its website: “Birthright Israel seeks to ensure the future of the Jewish people by strengthening Jewish identity, Jewish communities and connection with Israel.” This statement alone reflects a century-long history of conflating Zionism and Judaism: for Birthright, Jewish identity cannot be separated from the Israeli national identity. Established in Europe in the late 1800s, Zionism arose in response to other nationalist movements. As Italians identified with Italy and Germans with Germany, many Jews felt the need for a state of their own, especially in response to the rise of anti-Semitism in Europe. Once Zionism had become the nationalist movement of the Jewish people (specifically European Ashkenazi Jews), Zionists had to find a territory to which they could attach a national identity. After attempts to find this land in Uganda and Argentina failed, the Zionist movement settled on Palestine. In order to fit the modern European framework of national identity, certain aspects of Judaism were played down—for example, the diaspora—while others were amplified. (The Jewish diaspora refers to the historical dispersion of Jews and their settlement in other parts of the globe.) The traditional longing for the biblical land of Zion was reinterpreted as a core pillar of Jewish identity and became a modernized mission of colonization and settlement. Jewish heritage is no longer associated with places around the diaspora—like Casablanca, Baghdad, Madrid, Warsaw, and Budapest, places where Jewish communities and traditions have prospered for thousands of years. Instead, Zionism constructed “Jewish heritage” in a land which today is marked more by the colonial violence done by those who claim it their own than by rich, peaceful traditions of the kind that used to exist all around the diaspora. Fast-forward to the 21st century, and along comes Birthright, hoping to “motivate young people to continue to explore their Jewish identity [and] support for Israel.” Jake Buttock, a Colorado College student who participated in Birthright last winter, told me that he had decided to go because he had grown distant from Judaism in high school and college. Birthright for Jake was “a way to reconnect” to his Judaism. Another formative experience for Jake was visiting Yad Vashem, the Holocaust museum in Jerusalem. “The Holocaust museum was its own kind of separate experience,” he said. “Really beautiful … That was a really emotional experience for me. I learned a lot.” Mount Herzl and Yad Vashem are two formative locations for “Birthrighters.” In his book “Tours That Bind,” sociologist Shaul Kelner writes that the rigor of Birthright trips leads participants to experience an overwhelming emotional intensity that deflects their attention from the ideological incentives or critical thinking of the trip. Other participants I talked to also spoke of the intensity that Kelner describes. Indeed, the trip promises that the young diasporic Jews will not miss anything that is not “worth missing” in the Holy Land, be it riding camels in the Negev desert, floating in the Dead Sea, clubbing in Tel Aviv, or walking through the pastoral minefields of the Golan Heights. The border walls, security checkpoints, and segregated roads are all, apparently, worth missing. Israeli soldiers are, of course, human beings with aspirations, opinions of their own, and different ideologies and approaches to life. As an Israeli, most of my friends have served or are still serving in the IDF. Most of my family members have served in the IDF. Obviously, they are not villains. They are, however, tools in a system of military occupation, whether they are in support of it or not. Birthright does expose participants to the “human face” of soldiers—as if they were ever lacking one—but at the same time Birthright and its patrons use those faces as human shields to legitimize the Israeli occupation of Palestine. Yes, Israeli soldiers are human, but the military system in which they serve is far from humane. Birthright, with its objectives to make connections, makes all the wrong connections in the service of state violence. When I talked to soldiers and participants, it seemed like all of them were aware of the propaganda like feel that Birthright has. Djerassi, the soldier I spoke to, told me, “Israel is presented in the trip in a single-sided way, but I think that it’s legitimate because the people who fund Birthright wouldn’t want to take them … to Palestinian refugee camps, or Arab and Bedouin villages. They have an agenda and specific purpose, and that’s their way of pursuing it. It’s their money and they can do whatever they want with it.” She continued, “The goal of Birthright is to encourage Zionism, to promote Jewish immigration to Israel, or at least political and financial support.” Clearly, to participants and observers alike, it’s no secret that Birthright is politically motivated. A closer look into the organization’s funding reveals that Birthright is more than simply tourism and propaganda. Naturally, a 10-day trip full of fun attractions Indeed, the trip promises that the young diasporic Jews will not miss anything that is not “worth missing” in the Holy Land, be it camel riding in the Negev desert, floating in the Dead Sea, clubbing in Tel Aviv, or walking through the pastoral minefields of the Golan Heights. The border walls, security checkpoints, and segregated roads are all, apparently, worth missing. and good company, free of charge, sounds awesome. But Birthright’s biggest donor is Sheldon Adelson, the American billionaire who gave over $100 million to the 2016 Trump presidential campaign. Adelson happens to be close friends with Israeli Prime Minister Benjamin Netanyahu. Adelson also owns the daily newspaper Israel Today. This paper is handed out in train stations, malls, universities, and street corners in Israel for free. Just as most people seem to know that Birthright has propagandistic elements, it is widely known that Israel Today is filled with pro-Netanyahu propaganda. And just as Birthright, despite its propaganda, is popular because it’s free, Israelis read Israel Today because it’s free. Adelson has funded a number of Israeli projects in the West Bank, among them residential settlements, Ariel University, and a military base. In the opening ceremony for the Dr. Miriam and Sheldon Adelson School of Medicine in Ariel, Netanyahu praised Adelson as a “great patriot of the Jewish nation.” The money behind Birthright is not simply coming from pro-Israel sources— it’s coming from someone who is actively supporting the occupation of Palestine. In fact, the same guy who funds trips that paint a reality of Israel where the occupation of Palestine does not exist is the guy who makes sure the occupation remains an unyielding reality that will continue to exist for years to come. Who else funds Birthright? Aside from Adelson, Israeli taxpayers have contributed a third of the Birthright budget over the past 10 years. Somehow bringing Jewish Americans on a fun 10-day trip to Israel has become the responsibility of every Israeli. But Israel is not a country that can afford such luxuries. With a failed education system, high poverty rates, numerous corruption investigations (many of which involve Netanyahu), and draconian military spending, the Israeli annual budget clearly needs restructuring. But, under the Netanyahu-Adelson leadership, it has been more important to make sure that young American Jews get an opportunity to visit Yad Vashem, cry, connect to their heritage, and tell their parents how great Israel is. Ideally, they’ll also tell everyone that Israel protects the Jews of the world from another Holocaust. Of course, there’s more to it than that. For Adelson and Netanyahu, Birthright is a kind of investment. Adelson (and Israeli citizens) pay an upfront cost to get young Americans to fall in love with Israel, so that 20 years later, Israel might gain some powerful and wealthy supporters. But consider that out of the 200,000 Holocaust survivors in Israel, 50,000 live under the poverty line. Maybe the Israeli government should focus on aiding elderly Holocaust survivors instead of paying for Birthrighters to study them in a museum. But whatever, the (American) youth is the future anyways. With what rights should a citizen be born? The right to healthcare, we’d like to say, the right to an education and an equal chance at being employed. The right to vote and have a passport, to move freely and be equal under the law. The right to die of old age. These rights often become codified in a nation-state. When a right becomes a law, it’s considered legitimate, more legitimate than those rights that are not laws. The “Law of Return” was passed by the Israeli government in 1950. Jews had been pushing for a legal right to return, and the government promptly made that right a law. So, two years after the 1948 Arab-Israeli War (also known as the Nakba) and the establishment of Israel, the state asserted that Jews deserve to be able to return to the state of Israel and gain Israeli citizenship. But Palestinian refugees from the 1948 war also claim a right of return, contesting the notion that Jews are the only ones who deserve the ability to return “home.” Palestinians want to return to their property (or their ancestors’ property) in what is today Israel and West Bank territories. Both of these principles—the Law of Return and the right of return— are rooted in the concept of a birthright. The former is a legal right, while the latter remains a mere idea, one which the Israeli government has continuously delegitimized. So, what would make one inherently more deserving of that right? When it comes to the rights of Palestinians living in the occupied territories and the Gaza Strip, the rights they should have are far from those they do have. The result of the military occupation is that public schooling, healthcare, and welfare are dependent upon the goodwill of philanthropists and NGOs. And when you are under military occupation, you can’t vote for the government that controls you. 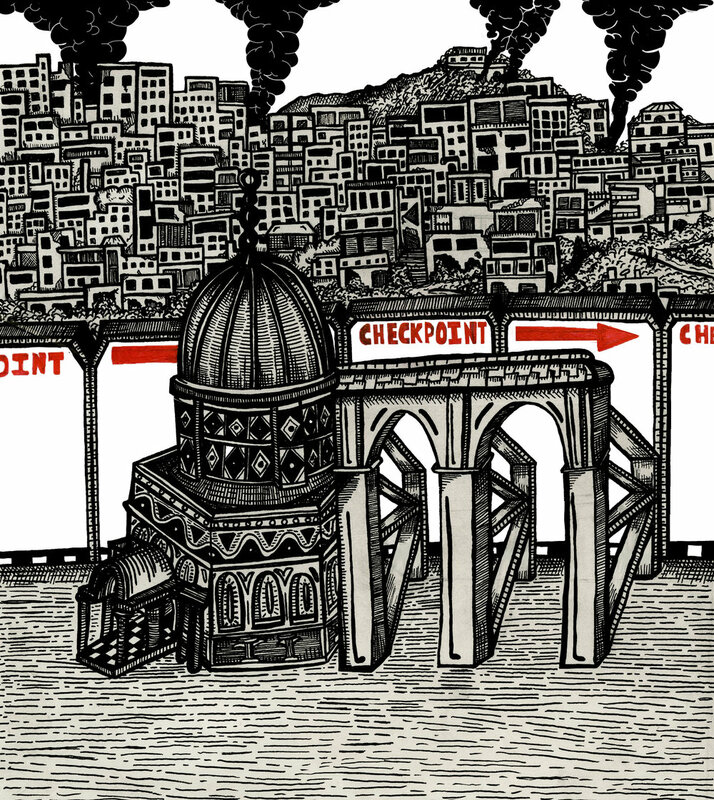 You have to stand in checkpoints for hours every day just to get to work. You don’t have a passport, and you can’t travel. Your chances of receiving proper medical care are close to zero. Your chances of dying of old age are minimal. Just as European nationalist movements defined themselves by removing those who did not fit into their national identities (for example, Jews), Zionism defined Jewish national identity specifically in contrast to the Palestinian identity. The Zionist community, in fact, cannot exist without the exclusion of Palestinians. This exclusion is necessary to draw the community’s boundaries. The granting of rights to Israeli citizens depends on depriving Palestinians of those very same rights. In this way, Zionism is intertwined with the Israeli occupation of Palestine economically, politically, and ideologically. To those of you who think it is your birthright: it is not. The Zionist claim to the land of Israel is a colonialist claim that renders the lives of Palestinians inferior and disposable. Birthright is not about Jewish heritage, Jewish identity, or a transnational Jewish community. It is about ideological profit. Many participants go into Birthright with a full critical awareness of the politics behind it. But it is difficult to be critical of a community while you’re in the midst of it. Collective identification is alluring; the comfort of being part of a group teaches us to turn a blind eye to the violent and exclusionary rules of the group. So potential participants critical of the occupation should consider that Birthright is funded by the same people who are funding the occupation. And if you already know what’s wrong with it, you should spend your time resisting the people and politics behind Birthright, not partaking in it.